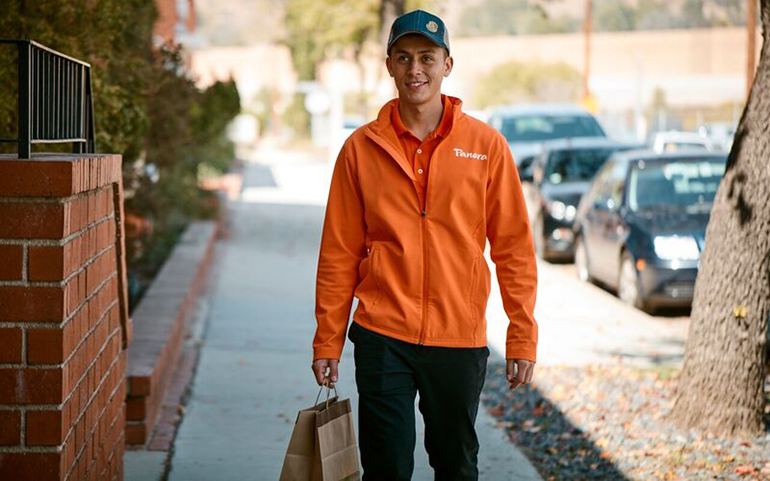 Panera Bread has expanded its 2-year-old delivery program to more than 1,300 stores across the U.S., making it one of the industry’s highest profile non-pizza restaurants to create its own fleet of doorstep delivery drivers. The St. Louis-based bakery-cafe chain, which has more than 2,000 restaurants, said it has about 13,000 drivers and employees supporting its delivery program in 897 cities across the nation. That’s up from 10,000 delivery-related jobs since the end of 2017. CEO Blaine Hurst said that growth means the service is no longer just a pilot program. The company began rolling out delivery through the Panera app or website in early 2016. Delivery is driving the company’s digital sales, which currently account for 30 percent of total sales, the company said. Digital sales also include kiosk orders. By creating its own fleet, Panera Bread is bucking a trend in which most restaurant chains are turning to third-party operators for meal delivery. But, those operators take a big cut — often as much as 30 percent — for their services. Warren Solochek, senior vice president of industry relations at Port Washington, N.Y.-based research firm The NPD Group, said the downside for Panera tackling their own delivery is higher labor costs at a time of when the employment rate is low. "Restaurants are having a more and more difficult time finding and retaining labor; in order for Panera to find and hire these drivers they will have to pay a competitive wage to other jobs," he said. Still, the benefit is that Panera owns the “customer relationship from start to finish," he said. Panera said its cafes offer delivery between the hours of 11 a.m. and 8 p.m., seven days a week. Delivery fees are about $3 in most markets, the company said. To celebrate the increased availability of delivery, the company will add a free cup of soup to any delivery order on May 9. Enter the code: PANERADELIVERS. Soup orders must include an additional purchase. Delivery fees are not waived.